The world-class quality of safety and comfort that you’ve come to expect from Turkish Airlines is taking another step forward. Turkish Airlines is partnering with Turkish Seat Industries in creating a seat that is the result of three years of meticulous study. The seats are based on an automated production system, which employs a zero fault production principle and is currently the world’s most efficiently produced aircraft seat. 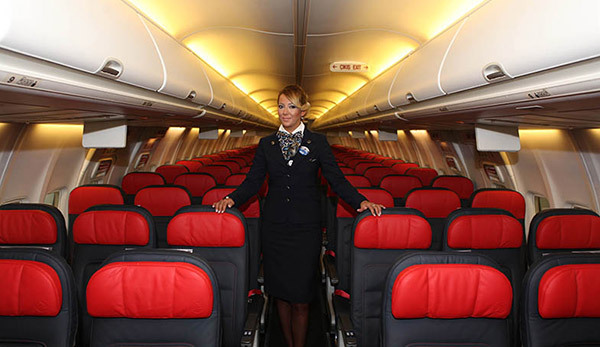 The seats are built using 100% Turkish products and Turkish production, in line with Turkish Airlines’ ultimate goal of having a total 100% Turkish aircraft production by 2023. Turkish Airlines always strives to give its passengers the highest quality in everything, which has led to it being awarded the best airline in Europe for three straight years by Skytrax. The first aircraft equipped with the new seats is a Turkish Airlines B737-800 and it was unveiled at a presentation hosted by Turkish Airlines at Atatürk Airport. The seats will initially be used on the airline’s B737-800s, and then be installed on the Airbus single-aisle fleet of A319s, A320s and A321s. It doesn’t matter if you’re Nigerian, South African, Kenyan or even British or German; when it comes to currency chances are you’ll think your country is worse off than everyone else in one way or another. While the South African Rand has fallen some 15% against the US Dollar, 26% against the Pound and 23% against the Euro in the last year, what we found is that we are far from being the worst off. Heathrow’s new Terminal 2 may experience early operational challenges during its first week of operation, resulting in delays for passengers. According to a report on BBC News, Heathrow’s bosses have warned that early teething problems should not be underestimated. “The chance of a completely smooth opening for any airport terminal in the world is low. We can never assume we can have a perfect opening,” comments the airport’s development director, John Holland-Kaye. The terminal will be opened in phases, which airline officials hope will be helpful should challenges occur. The Victoria Falls International Airport expansion project, which includes the construction of an additional terminal and runway, is currently on schedule and should be completed by April 2015. According to Ronnie Masawi, airport manager, the new runway will cater for wide-body aircraft, and the new International Terminal will be able to handle 1.2 million passengers per annum. The project will see the existing terminal building upgraded and changed to a domestic terminal, while the existing runway will be strengthened and used as a full-length taxiway. A new landside and airside road network as well as new car parking will also be constructed. The project is costing $150million (R1.6 billion). The airport development has been welcomed by the industry. Ross Kennedy, CEO of Africa Albida Tourism, believes the airport development will boost tourism to Zimbabwe and the region because it will establish Victoria Falls as a hub for regional leisure tourism. “Air-lift capacity and access are fundamental to growth and development of tourism across Africa, and this new airport will be a significant enhancement to the entire African tourism network,” Ross says. Trish Mambinge, Shearwater Victoria Falls GM, expects to see an increase in tourism arrivals with the expansion of the airport. She adds that some airlines have already shown interest in flying directly into Victoria Falls. Swiss International Air Lines subsidiary Edelweiss is going to be flying their seasonal Cape Town to Zurich flights again from the 27th October 2014 until the 1st May 2015. Monday flights are scheduled to leave Cape Town at 19h45 (and land in Zurich at 06h10) and Friday flights are scheduled to leave CPT at 23h30 (and arrive in Zurich at 09h55). Both frequencies use flight code WK85. The twice weekly flights are in an Airbus A330-200, which will have seats for Edelweiss’s new Economy Max class of travel, in addition to the standard economy and business class seats. April in South Africa means public holidays! If you’re can get your leave approved in time you stand to benefit in terms of days off. Put in leave between Good Friday, Freedom Day and Workers Day and get a consecutive 14 days off and more time to travel. In other words, permission to take 6 annual leave days translates into an effective 2 week holiday! 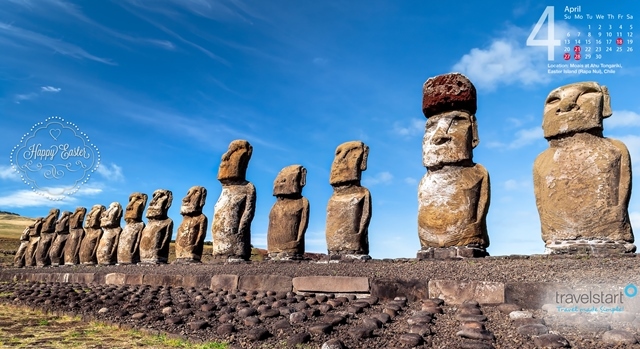 In recognition of the month of public holidays we’ve got an awesome Easter Island wallpaper calendar for your desktop and mobile devices. You can now clear U.S. immigration before taking off in Abu Dhabi International Airport. All Etihad Airways guests flying to select destinations in the U.S. will have access to Abu Dhabi International Airport’s United States Preclearance facility located at Terminal 3. The new facility enables guests flying Etihad Airways to pre-clear the U.S. Customs and Border Protection formalities before boarding their flights in Abu Dhabi. Upon arrival in the U.S., you will be treated as though you are a domestic arrival. Shorter connection times are possible for onward flights in the U.S., with your luggage arriving at your final destination. SAA advises customers that this phishing scam features from time to time and targets airline customers, as a way of getting to credit card and Voyager log-in details, as well as their personal information. The scam involves emails thanking customers for their purchase, stating that their booking is confirmed, giving a booking reference number as well as the credit card charge and then asking the customer to follow a link. These emails are not from SAA, as is wrongfully stated in the email. Clients who receive these emails, should delete them immediately and not enter any personal information. “Furthermore, we would like to advise customers that, no matter how authentic such emails may seem, any email supposedly from the airline that has a link to an Internet banking sign-on page, or a page requesting any personal or banking information, is not from SAA. In addition, customers are advised never to click on such a link as it will take them to a fraudulent website where their banking details, including a PIN or customer selected PIN may be compromised.” says SAA spokesperson, Tlali Tlali. He adds that SAA will never include a link that takes customers directly to a log-in page. SAA did not comment on how the fraudsters got hold of the client’s information. SA Express has confirmed that it has plans to launch flights to Lesotho. While implementation of the route has been postponed until further notice, the airline has expressed its commitment to extending its operations to the area.